The good, bad and sometimes unhealty!! I having been waiting for the winter to be over before it even started last year. I imagined myself out shopping without worrying about whether or not the store had a plus size section or if their size 12 was a small 12 or big 12. I woke up this morning, turned to the weather channel and saw a high of 71 degrees and instantly became depressed. For the past 5 years I have been trying to lose weight, get back to a healthy state and just feel good about my outer appearance, and each year I GAIN 5-7 pounds. I have continually stood behind excuses like work, parenting, its too cold out, its too hot out and for five years straight I have failed miserably in the weight loss department… sad but true! I have been a member of numerous gyms, currently I pay close to $200 monthly for my multiple gym memberships and at least two of them I have not been to in over a year…. another sad but true personal fact! So here I am today – Female, 30 years old, 5.5inch and very close to 200lbs… Something has got to change and for the 100th time I find myself at the “STARTING OVER” point. This time, I am going to try it publicly and uncensored via this blog. I will celebrate my good days, vent on my bad days and seek motivation on my so-so days. I am pressing the reset button for the last time and beginning my journey today… so here we go! Food:For an entire week, I am committing to Slim Fast shakes – I plan on having on for breakfast and one for lunch. They are convenient, I surprising like the taste of the chocolate and strawberry flavors and they seem to be filling. I plan on snacking on fruits and having a very healthy dinner before 8pm. This week my dinner choice is soup. Now…. this all sounds good (as it always does) but the missing link is always DISCIPLINE!! I have done pretty good so far today, had my two shakes with lots of water and fruit – here is to hoping I can keep this up tonight – healthy dinner and NO WINE (a weakness). Workout tomorrow AM.. that is the plan – will let you know how it goes!! Upward and Onward We Go! 50 pounds of weight loss is the goal! This entry was posted in Food, Uncategorized, Weight Loss and tagged fitness, parent, pool, running, slim fast, soup, spring, summer, swimsuit edition, team, water, weight loss, workout. Bookmark the permalink. Good luck! It’s always like inertia, when you are at rest you want to stay at rest. 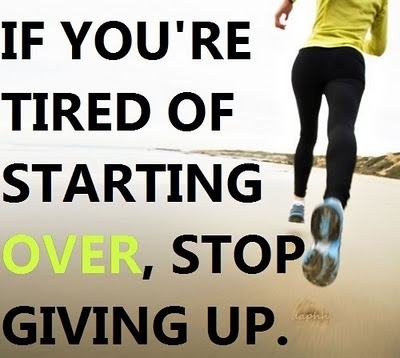 It is harder to get started than it is to keep going. I wish you the best. I suggest doing what I do, make 1 change to your lifestyle every 2 weeks, so you can ease into it. So, instead of biting off diet and exercise at 1 time, choose 1. You need to set attainable standards, and working out 5 days a week while drinking breakfast and lunch might not be the easiest way to do it. I wish you the best on your journey and will definitely be following you! 1. Learning to cook and enjoy healthy foods, made out of real ingredients. Seriously, processed food makes your body confused. 2. Don’t think of how you can force yourself to run, think of how you can make running so fun for yourself, you’re addicted to going! Or the gym. Or swimming, or yoga, or whatever activity you most enjoy. Is it nice music? Is it going with a friend? Is it having really awesome shoes that you love wearing every time you run? Don’t force yourself to run, SEDUCE yourself into running! 2b. Sometimes you DO need to force yourself to start an exercise regime, because you just get inertia and don’t feel like doing anything. If you can manage to do it every day for around 2 weeks, you’ll get into it and it won’t be such a chore anymore! The way to force yourself to do stuff (and this only works for short periods of time, in the long-term you have to find stuff you actually enjoy)…what I do is set a timer and say “I’m going to swim for 10 minutes. At 10 minutes and 1 sec, I’m allowed to get out of the pool and be lazy for the rest of the day, but for that 10 minutes, I’m just swimming.” Usually once I get started I want to do more. Every once in a while I stop at 10 mins. But the limit makes it less terrible to contemplate. 10 minutes, that’s not so long right? Anyways good luck with getting in shape, it’s totally possible! Thanks, hope they can be useful! No prob! Hope it can help! Looking forward to hearing about your progress! Good start – stick with it! Congrats on resetting today!! I think you can definitely reach your goals and hopefully the blog will help you. Your end goal of running for 45 minutes 5 times a week is a good goal. I run in the morning. Out of the house by 4:30 a.m. — I understand the desire to hit snooze and turn over (and yeah, I do it too) — what I have found that works for me is telling myself that while I want to run 45 minutes its okay if today I only run 20 minutes (or 10 minutes for that matter). Because in the beginning it doesn’t matter how far you run, it simply matters that you get out there and run — you’re trying to build a habit — the distance and time will come after you’ve acquired the real habit of getting up in the morning and running. So be strict and disciplined in the getting up and getting out of the house part, but ease into the time and distance. Ten minutes of running doesn’t sound as bad to a body that just wants to hibernate under the covers as 45 minutes — and truthfully after I get out of the house and run ten minutes I usually ALWAYS run longer because I’m out there and it feels good. Good luck!! I can appreciate the realness and honesty if this post. Hope you stay focused, I too will be focused. Lets motivate each other. Good luck!! !